The New Jersey Devils and Philadelphia Flyers will face off in the Eastern Conference Semifinal beginning Sunday at Wells Fargo Center in South Philadelphia. The two Atlantic Division rivals enter the second round of the Stanley Cup Playoffs after playing completely different opening round series. Philadelphia will have had a week off when the puck drops on Sunday at 3 P.M., after eliminating the Pittsburgh Penguins in a wild six-game series on April 22. The matchup with Pittsburgh was marred by various cheap shots, ejections, and a combination of high-powered offense and horrendous defense, highlighted by three games in which the winner scored at least eight goals. New Jersey enters the Semifinals after playing a grueling seven-game series against Florida in which they twice staved off elimination, grinding out an overtime victory in Game 6 and a double-overtime thriller on the road in Game 7 that ended early Friday morning. The two clubs split their six regular season meetings, with each team winning three games (with one of the Devils wins coming in a shootout in Philadelphia on November 3) and each team winning two games on the road. They finished virtually even in the regular season standings, with the Flyers registering 103 points and New Jersey 102. For New Jersey, the key to winning the series will be special teams. Their penalty killing unit, which set an NHL record this season (89.6%), was a surprising weakness in the Florida series that continuously haunted them, as the Panthers were able to score nine power play goals over seven games. They’ll face a Philadelphia power play that scored 12 goals (52.2%) against Pittsburgh’s outstanding penalty kill unit in Round 1. The Devils power play unit, which had an up-and-down regular season, logged five goals in the Florida series, a respectable, but not particularly impressive, 20.0% clip. Against Philadelphia, they will need to be better. For the Flyers, continuing the offensive dominance they showed against the Penguins, in which they scored an explosive 30 goals in six games, will be key. Keeping the pressure on New Jersey’s veteran defensemen, and soon-to-be 40-year-old goaltender Martin Brodeur, will be an important piece of their game plan. The Flyers offense is led by the always-dangerous Claude Giroux. The right wing, who head coach Peter Laviolette called “the best player in the world” after the Pittsburgh series, will be looking to continue to carry the team. 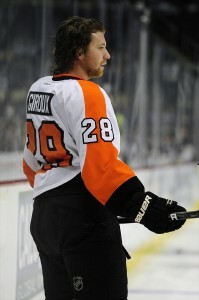 Giroux netted six goals in the first round, in addition to eight assists. The wild card for New Jersey is their fourth line. Stephen Gionta, Steve Bernier, and Ryan Carter made major contributions to the team in the Florida series, logging a combined five goals and nine points along with a plus-12 rating. Additionally, Gionta and Bernier contributed several big hits during their line’s limited time on the ice. Whether or not New Jersey continues to get unexpected contributions from this line could be a huge factor in the series. Philadelphia’s wild card is goaltender Ilya Bryzgalov. The quirky Russian started all six games in Round 1, posting a putrid 3.89 GAA and .871 Sv %. Despite the awful stats, Bryzgalov had a brilliant Game 6 in which he stopped 30 of 31 shots en route to a series-clinching victory. The question is, which Bryzgalov will show up vs. New Jersey? The one who was so good in Game 6, or the one who was a sieve for most of the series? The previous rivalry between the teams, their close geographic proximity, and the all-or-nothing atmosphere of the playoffs should make this one of the more interesting series in this year’s road to the Stanley Cup.